"In Alaska you can make one mistake. One. The second one will kill you." 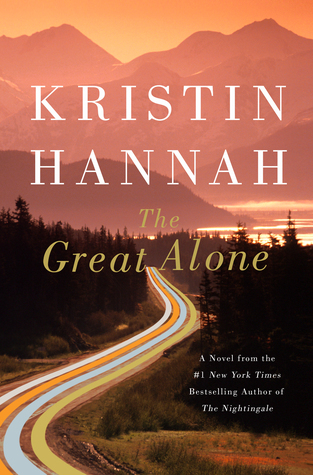 Before I read The Great Alone I didn't know much about Alaska - about the people who went there to live a different life or about the beauty of the state. Kristin Hannah does a wonderful job giving the reader a beautiful story along with wonderful descriptions of Alaska. I must admit that I felt cold sitting in my warm house when I read her descriptions of the blowing snow and the cold temperatures. This is a wonderful novel about love and family - both your family by blood and those you collect along the way. In the early 70s, Cora and Ernt decide to move to Alaska because an Army friend has left them a cabin in a remote area. Ernt is a Vietnam veteran who has spent time in a POW camp and is suffering from what we would refer to today as PTSD. Along with their 13-year-old daughter Leni, they drive to Alaska to their new lives. They are totally unprepared for what is ahead of them and people in their small town help them get started. Life is tough and the family lives right on the edge of survival. Along with physical survival, Ernt is a violent man and Cora and Leni are always trying to keep him happy. At times you aren't sure if the real violence is from the weather and the elements or if it's from the danger inside their cabin. Leni is a wonderful character and this is a real coming of age story for her as she grows from a 13-year-old to an adult. This is a wonderful story of survival - physical as well as mental - love, and family. I highly recommend it!